The events of Shôhei Imamura’s cruelly entertaining Pigs and Battleships take place during the transitional period for Japanese society when the once-proud nation was still reeling economically and spiritually from defeat in the Second World War while being occupied by the American military due to the renewal of the American-Japan Security Treaty. In the port town of Yokosuka, young couple Kinta (Hiroyuki Nagato) and Haruko (Jitsuko Yoshimura) are reaching a crossroads in their relationship; Kinta associates with a low-level yakuza crew, aiming to become a ‘big shot’, while Haruko wants to leave town and encourages Kinta to take a stable, if low-paid, factory position in a neighbouring community. Kinta and Haruko may have different ideas about how to ensure a better future, but both are reacting to their surrounding environment, which is essentially a red light district populated by pimps, prostitutes and petty criminals, with the local economy being propped up by the after-hours activities of the American Navy shipmen stationed there. The mutual and individual choices of the central couple are also informed by their respective familial circumstances, as Kinta has seen his hard-working father struggle to make ends meet, while Haruko’s parents want her to follow in her sister’s footsteps by entering into an arranged marriage with an American soldier. Despite protestations from the down-to-earth Haruko, the naí¯ve Kinta believes that he can become a prominent underworld player if he takes the fall for a hit that he did not commit and help with a scheme to start a pig farm. Imamura surrounds Kinta and Haruko with a motley assortment of acquaintances, most of whom are swindlers on some level, thereby showing a morally polluted cross-section of post-war Japanese society. In narrative terms, Pigs and Battleships is rather ramshackle, but more rooted in genre than such subsequent Imamura works as The Pornographers (1966) and Profound Desires of the Gods (1968), meaning that this is arguably one of his most accessible films. Still, the director certainly orchestrates a collision of styles, with black comedy, crime drama and social-political critique jostling for tonal supremacy, making Pigs and Battleships a typically ‘messy’ film by modern cinema’s foremost cultural anthropologist. 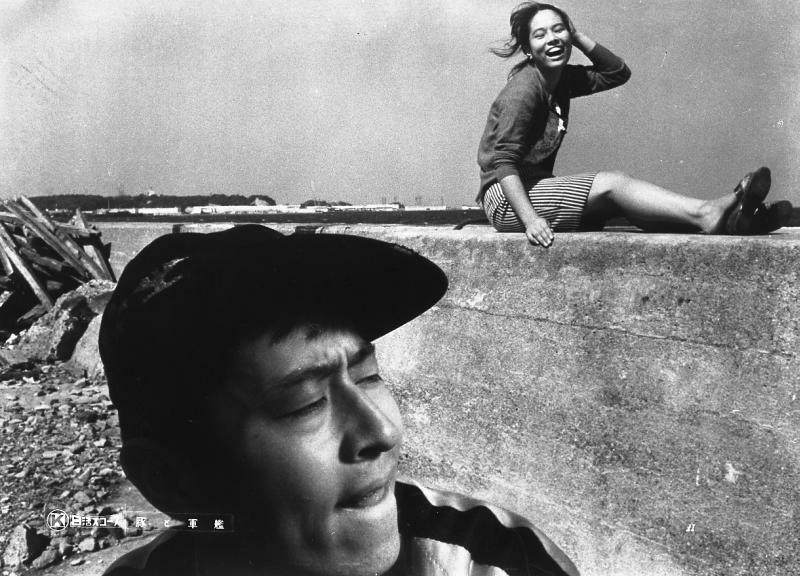 The opening scenes serve to set up Imamura’s social investigation, with his camera initially focusing on the brand new buildings adorned with the American flag that have been constructed on higher ground, before panning across the town, then down to the slum where sailors wander the otherwise empty streets. From this omniscient daytime view of Yokosuka, the director cuts to a street-level excursion around the red light district after the sun has gone down and sailors are sufficiently drunk to open up their wallets for sexual services. Amid the squalor, Imamura skilfully introduces Kinta and Haruko when the former steals the cap of a sailor as a means of leading the American to a back-street brothel, while the latter is seen working as a waitress in the adjoining bar. With the rocky relationship between the young couple and the machinations of the local mobsters providing narrative foundation, Imamura allows his stylistic impulses to run riot: restless tracking shots, ‘Scope photography, and the celebrated use of a spinning camera to capture the violation of Haruko by a trio of sailors are examples of Imamura’s then-emerging virtuosity. Yet, he often returns to the plight of Haruko in order to keep his energetic crime caper on the rails. Due to her strong-willed individuality, Haruko is the only character for whom Imamura seems to hold out any hope; she is seeking escape not only from the temptations of Westernisation, but also from the trappings of familial traditionalism, eventually resulting in a breakdown in relations with both Kinta and her parents. Haruko is not perfect as she makes errors in judgment and remains loyal to Kinta when she should just cut and run, but Imamura often portrayed women as survivors, and the progressive Haruko is no exception. Everyone else is either corrupted by the lure of easy money, or simply incompetent, hence Imamura’s mockery. Dark humour abounds, especially when a corpse washes up after being dumped at sea and then fed to the pigs, only for the bones and false teeth to turn up in a pork lunch, while the climax - with blazing machine guns and pigs running wild in the streets - is pure farce. Pigs and Battleships caused such controversy on release in 1961 that Imamura was suspended from filmmaking for two years by studio Nikkatsu. He used the time to develop screenplays as contractual conditions prevented him from seeking directorial work elsewhere, and returned from the wilderness with The Insect Woman (1963), a powerful portrayal of rural poverty. However, it is possible that his suspension had less to do with his cynical depiction of American-Japanese relations - Nikkatsu was known for chasing trouble in order to boost box office takings - than it did with angering studio executives by going over budget on the action scenes. A vivid indictment of a nation struggling with a serious identity crisis, Pigs and Battleships is a biting social satire by a truly brilliant filmmaker.